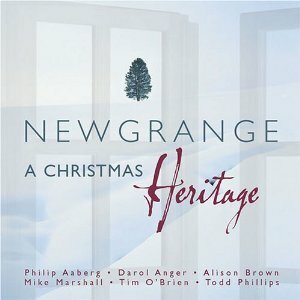 A reissue/repackage of a highly regarded 1998 release, A Christmas Heritage closed out a banner 2005 for Tim O'Brien (whose Fiddler's Green, which won a Grammy Award for Best Traditional Folk Album, and its companion long player, Cornbread Nation, ranked with the year's best acoustic music entries). He stands out in this septet of super pickers in the role of multi-instrumentalist, vocalist and writer. Partnering up with him in a most delectable holiday dialogue is a solid lineup numbering Philip Aaberg on piano, Darol Anger on violin, Alison Brown on banjo and guitar, Todd Phillips on bass and Mike Marshall on mandolin and guitar. Equally rooted in traditional and progressive modes, these formidable musicians easily traverse bluegrass, country, pop, even jazz terrains (check out the sprightly interaction between the various instruments supporting O'Brien's gospel-style vocal on a swinging interpretation of "Go Tell It On the Mountain").